The process of dressing selection is determined by a number of factors including the nature and location of the wound, and the range of materials available. In most situations the cost of treatment is also a major factor. This article describes some of these parameters in detail and provides advice on the formation of a structured approach to the selection process. Many sophisticated dressings are available to the wound care practitioner, made from a wide range of materials including polyurethane, salts of alginic acid and other gelable polysaccharides such as starch and carboxymethylcellulose. These materials may be used alone or in combination to form products as diverse as films, foams, fibrous products, beads, hydrogels or adhesive gel-forming wafers more commonly called hydrocolloid dressings. Depending upon their structure and composition, such dressings may variously be used to absorb exudate, combat odour and infection, relieve pain, promote autolytic debridement (wound cleansing) or provide and maintain a moist environment at the wound surface to facilitate the production of granulation tissue and the process of epithelialisation. This may mean that they are only suitable for the treatment of specific types of wounds or for the management of a wider range of wounds during a particular phase of the healing cycle. Wound healing is a dynamic process and the performance requirements of a dressing can change as the wound progresses towards healing. Effective wound management requires an understanding of the process of tissue repair and a knowledge of the properties of the dressings available. Only when these two factors are considered together can the process of dressing selection be undertaken in a logical and informed fashion. Before the dressing selection process can begin, it is first necessary to identify the purpose or principal aim of the proposed treatment. In most instances this will be to facilitate cosmetically acceptable healing in the shortest possible time. Occasionally, however, priorities change and speed and quality of healing may cease to be of primary importance. For example, a recent publication  described how larval therapy, (maggot treatment), was used successfully in the treatment of a patient with extensive ischaemic damage to his feet. The patient was terminally ill, and the aim of treatment was not to induce healing but to bring about removal of the extensive areas of necrosis which caused the patient severe pain, and also to reduce or eliminate the foul odour that was a source of distress to the patient's family and carers. Rapid healing may also not be a realistic aim for patients with a large malignant wound, Image 1. 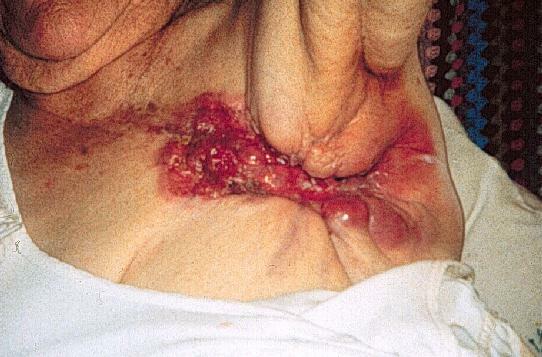 Image 1 - a malignant (fungating) wound. For such patients it may be more important to concentrate on removal or containment of both the odour and the copious exudate produced by the discharging lesion. This may allow an individual who is mobile and otherwise able to live a reasonably normal life to do so uninhibited by embarrassment caused by an offensive discharge from their wound. Occasionally, the pain associated with dressing changes can be such that a patient requires potent analgesia. In these circumstances the priority may be to identify a product that can be easily removed whilst causing minimal pain and trauma. If clinical infection is present, it may be necessary to use a dressing that has proven antibacterial properties as an adjunct to systemic therapy. Occasionally a wound may cause a patient psychological problems because of their altered body image, and in this situation a dressing may be applied to conceal or mask the perceived `deformity'. The principal reasons for applying a dressing can therefore be summarised as follows. Once the treatment aims have been clearly established, the selection process can begin. The choice of dressing or treatment regimen may be influenced by many different factors, but for practical purposes these can be divided into three principal inter-related groups which may be described as wound, product or patient related, although other economic factors may be important in some instances. These include the nature and location of the wound, the presence or risk of infection and the amount of exudate produced. A simple wound classification system such as that shown below forms a useful starting point in the selection process. Within this classification wounds are divided into four basic types according to their appearance but it will be immediately obvious that these groups could be further sub-divided to take account of wound aetiology or depth for example. Epithelialising wounds - which show evidence of a pink margin to the wound or isolated pink islands on the surface. It will be recognised that these descriptions relate not only to different types of wounds but also to the various stages through which a single wound may pass as it heals. Under favourable conditions, dead tissue in a wound such as a pressure sore will usually separate spontaneously from the healthy tissue beneath. This occurs as a result of autolysis and presumably involves macrophage activity and the action of proteolytic enzymes which act at the interface of the necrotic and healthy tissue. Image 2 - Black necrotic wound. In this condition, autolysis is inhibited and separation of the necrotic tissue may be delayed indefinitely. This process of dehydration is often associated with the onset of pain. Contractile forces produced as the dead tissue shrinks, stimulate receptors in the healing tissue around the wound margin. It follows, therefore, that any product or treatment that delays or reverses the process of dehydration may alleviate pain and facilitate autolytic debridement. There are three principal ways in which this may be achieved. The first, and probably the least efficient, is by the application of soaks or wet packs. These consists of gauze pads or nonwoven swabs soaked in water, saline or other solutions such as sodium hypochlorite (Dakin's solutions or Eusol). The disadvantage of this technique is that the pads require frequent replacement which is time consuming, and may cause maceration of the surrounding skin. A more convenient method, is the application of a hydrogel dressing such as Intrasite Gel (Smith and Nephew Medical Ltd), Granugel (Convatec Ltd), Sterigel (Seton Healthcare Ltd) Nu-gel (Johnson and Johnson Medical Ltd), or one of the other brands available. Most of these products share a common basic structure consisting of about 2-3% of a gel-forming polymer such as sodium carboxymethylcellulose, modified starch or sodium alginate, together with 20% propylene glycol as a humectant and preservative. The balance, about 80%, consists of water. The gel is placed placed on the wound and covered with an appropriate secondary dressing. For very dry wounds, the selected dressing should prevent the loss moisture from the gel either by evaporation or by absorbtion into the outer layer. Suitable secondary dressings include the perforated plastic film absorbent dressings Melolin (Smith and Nephew Medical Ltd) or Telfa (Kendall Ltd) or a vapour permeable film such as Opsite (Smith and Nephew Medical Ltd), Tegaderm (3M Health Care Ltd) or Bioclusive (Johnson and Johnson Ltd). When applied in this way, water will be donated from the gel to the dead tissue, causing it to become rehydrated and thus more easily removed. Although most of the gels are similar in appearance, laboratory tests have indicated that their fluid donating properties can vary considerably. Some products, but not all, are also able to absorb a limited amount of fluid from exuding wounds. An alternative method of rehydrating necrotic tissue depends upon the use of a hydrocolloid dressing. These are available from many different manufacturers but as with the hydrogels, despite superficial similarities in appearance, significant differences exist between the different brands. Most hydrogels are virtually impermeable to moisture vapour when taken out of the packet. If placed on a necrotic wound, therefore, they act as a physical barrier, preventing the loss of moisture vapour through the dead tissue to the external environment. As a result, moisture accumulates within the necrotic layer causing it to become rehydrated. Whichever technique is selected, when the necrotic covering eventually separates, it freqently leaves behind a wound containing yellow, partially liquified material known as slough. This forms the second group of wounds within this simple classification. 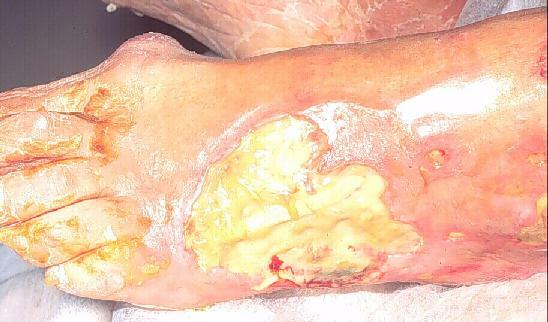 In addition to wounds such as pressure sores, from which a necrotic covering has been removed, other wounds such as burns and leg ulcers often develop a glutinous yellow covering (Image 3). This is not dead tissue, but a complex mixture of fibrin, deoxyribonucleo-protein, serous exudate, leucocytes and bacteria. A thick layer of slough can build up rapidly on the surface of a previously clean wound but this should not be confused with the thin pale yellow fibrinous coating which sometimes develops as a normal part of the healing process. It has been shown experimentally that slough and devitalised tissue will predispose a wound to infection by acting as a bacteriological culture medium and inhibiting the action of leucocytes in the wound . For this reason, in order to achieve an acceptable rate of healing, such wounds must first be properly cleansed or debrided. Surgery is by far the quickest method but as this is not always practicable, other techniques must sometimes be adopted. Traditionally, agents such as sodium hypochlorite and hydrogen peroxide have been used in the form of soaks but these are of limited efficacy and may also have an adverse effect upon the healing process. Aserbine, a proprietary solution containing malic acid, benzoic acic and salicylic acid is also available but this is not widely used by wound care specialists. Probably the first modern dressing to be marketed specifically for use as a wound cleansing agent was the polysaccharide bead dressing Debrisan (Pharmacia Ltd). When applied to relatively small moist sloughy wounds the beads absorb fluid and progressively move bacteria and cellular debris away from the surface of the wound. Iodosorb (Perstorp) although similar to Debrisan in appearance, also contains elemental iodine which is liberated to exert an antibacterial effect in the wound when the dressing absorbs liquid. Shallow sloughy wounds which produce limited amounts of exudate can be treated with a hydrocolloid dressing that facilitates autolysis by the mechanisms described previously. Sloughy wounds which also produce a degree of exudate may be dressed with alginate dressings such as Sorbsan (Maersk), Tegagen (3M Health Care Ltd), Kaltostat (Convatec Ltd) or other gel forming polysaccharide dressings such as Aquacel (Convatec Ltd). The gel which is formed as these products absorb exudate forms a moist covering over the slough preventing it from drying out. Because these gel-forming fibrous dressings require moisture to function correctly, there is little point applying them to dry sloughy wounds or those covered with hard necrotic tissue. Other materials which are sometimes used to debride sloughy wounds include enzymatic agents such as Varidase (Lederle Laboratories), crab collagenase and krill. Polysaccharides such as honey and sucrose have also been used to facilitate wound cleansing. Although ordinary granulated or icing sugar has been used successfully,  recent interest has been focused on the use of a sugar paste containing polyethylene glycol 400 and hydrogen peroxide  . A significant development in the area of wound cleansing is the renewed interest in the use of larval therapy (maggots) for the rapid removal of slough and necrotic tissue from wounds such as leg ulcers, pressure sores and lesions on the feet of diabetic patients . It has also been reported that larvae are of value in burns,  and plastic surgery for cleansing wounds prior to grafting . The larvae used are those of the common greenbottle Lucilia sericata which are produced commercially as `LarvE' (Biosurgical Research Unit). Whichever technique is selected, once the slough has been removed, the formation of granulation tissue can take place unhindered. Granulation tissue is composed of collagen and proteoglycans, a complex mixture of proteins and polysaccharides together with salts and other colloidal materials. These produce a gel-like matrix which is contained within the fibrous collagen network. Its highly vascular nature gives it a characteristic deep pink or red colour (Image 4). 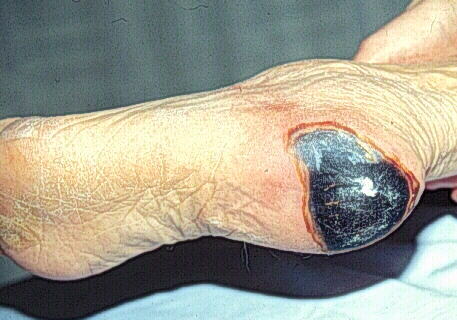 Image 4 - Granulating wound (pressure sore). Granulating wounds vary considerably in size, shape, and the amount of exudate that they produce. As a result, no one dressing will be suitable for use in all situations. Cavity wounds, traditionally packed with gauze soaked in saline, hypochlorite, or proflavine, are now more commonly dressed with alginate fibre in the form of ribbon or rope. In the past, larger cavities such as those remaining following the excision of a pilonidal sinus were managed very successfully with a silicone foam dressing formed in situ from two liquids carefully measured out in the correct proportions and mixed thoroughly before being introduced into the wound . Originally called Silastic foam, this dressing has changed ownership and been completely reformulated as Cavi-Care (Smith and Nephew Medical Ltd). Cavi-Care should not be introduced into narrow sinuses or cavities which are partially constricted, or wounds with undermining or tracking as in these situations there is a real danger that a piece of foam will become detached and remain in the wound, leading to a foreign body reaction or the formation of an abscess. An alternative dressing for cavity wounds, Allevyn Cavity Wound Dressing (Smith & Nephew Medical), consists of foam chips enclosed in a soft flexible plastic pouch the surface of which contains small perforations to allow the entry of exudate. The dressing, which is highly absorbent, is produced in a small range of shapes and sizes to fit different sized wounds. For more shallow heavily exuding wounds such as leg ulcers, fibrous sheet dressings made from alginate fibre are commonly used. If exudate production is not a problem, the use of a hydrocolloid dressing may be preferred. Other dressings which are used for the treatment of chronic exuding wounds include the highly absorbent hydrophilic foam products Allevyn and Allevyn Adhesive (Smith & Nephew Medical Ltd), an island dressing Tielle, (Johnson and Johnson), and Lyfoam Extra (Seton Healthcare). Recently launched Combiderm (Convatec Ltd), which consists of a self-adhesive absorbent pad containing a superabsorbent in powder form, is also capable of absorbing and retaining large volumes of fluid even under pressure. For more lighly exuding wounds, thin polyurethane foam products are available such as Lyofoam (Seton Healthcare), which has limited absorbency but which is highly permeable to moisture vapour. Lyofoam is also used as low-adherent dressing for minor injuries and other wounds in the final stages of healing. Some chronic wounds produce an unpleasant odour as a result of bacterial contamination. Products containing an antibacterial agent may be used in conjunction with systemic antibiotic therapy, to control the infection which causes the problem, and dressings containing activated charcoal such as Actisorb Plus (Johnson and Johnson Medical Ltd) or Lyofoam C (Seton Healthcare Ltd), can be applied to control the odour. One group of wounds that are particularly difficult to heal are sinuses and other lesions which have a narrow opening leading to a flask shaped cavity under the skin. Some form of packing is generally inserted into such wounds to ensure that the entrance does not close over before the main body of the wound is healed. Traditionally, ribbon gauze packs have been used, but a number of the new dressing materials may also be of value. If the wound is moist, it may be lightly packed with alginate ribbon using a suitable probe, but care should be taken to ensure that it is not inserted too tightly. Research has shown that alginate ribbon has advantages over ribbon gauze in these situations. Hydrocolloid granules and pastes can be used for small cavity wounds, alternatively, a hydrogel dressing may be introduced into the cavity or sinus using a syringe and quill if necessary. Such gels are particularly useful if slough is present in the wound. Ribbon gauze impregnated with gel has been used if physical packing of the wound is indicated. It is important to note that it would be unwise to introduce any of these gel forming materials into a sinus which may connect with a body cavity until the wound has been carefully probed or the depth determined by some other means. The production of granulation tissue continues until the base of the original cavity is almost level with the surrounding skin. At this stage, the process of epithelialisation begins around the wound margin or is formed as islands from the remains of hair follicles or sweat glands within the wound itself. With a few notable exceptions, superficial or epithelialising wounds (Image 5) tend not to produce large quantities of exudate. 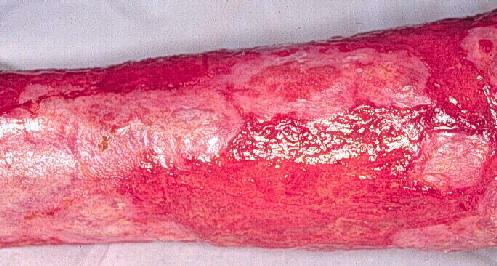 Image 5 - Epithelialising wound. Fluid production can be a problem, however, in burns and donor sites. Traditionally, these wounds have been dressed with paraffin gauze covered with a layer of Gauze and Cotton Tissue ("Gamgee") but some centres have reported that both alginates  and hydrocolloid dressings offer significant advantages in these situations. The later reducing the time to healing of donor sites to about 7 days compared to 10-14 days for comparable wounds dressed with conventional fabric dressings. Alginates have the additional advantage over cellulose dressings that they can be removed without causing pain or trauma if they are first well soaked with a sterile solution of normal saline. Superficial wounds which produce relatively little exudate may be dressed either with the hydrocolloids or one of the semipermeable film dressings referred to previously. These materials are also used as catheter dressings and are even applied prophylactically to prevent or reduce friction damage to the skin of bedridden patients. Other dressings which are used in the final stages of the healing process include the perforated plastic film dressings (see above) and the knitted viscose products such as N-A Dressing (Johnson & Johnson Medical Ltd), and Tricotex (Smith & Nephew Medical Ltd). Recently three new low adherent wound contact layers have been introduced. These are NA Ultra (Johnson and Johnson Medical Ltd), which consists of a knitted viscose fabric impregnated with silicone, Mepitel (Molnlycke) which also consists of a knitted fabric impregnated with silicone, and Tegapore (3M Health Care Ltd), a thin sheet of a woven nylon net with very small, well defined holes. All three dressings represent a useful alternatives to the largely outdated paraffin gauze dressings ('Tulle Gras') that were first developed about the time of the 1914-18 World War. All wounds, regardless of type, may become colonised by microorganisms which in turn may cause the formation of unpleasant odours. If these organisms increase in number past a certain critical level, then the wound may develop a clinical infection which may necessitate treatment with systemic antibiotics and/or the use of a medicated dressing. Sometimes a wound can become infected with an organism that is resistant to normal antimicrobial therapy and in these instances a dressing that forms an effective bacterial barrier can be used to cover the wound in order to prevent the spread of the resistant organism. Some paraffin gauze dressings are available medicated with antibiotics or antimicrobial agents for the treatment of prevention of infection. These include Sofra-Tulle (Hoechst), containing framycetin, Fucidin Intertulle (Leo). Bactigras (Smith and Nephew Medical Ltd, Serotulle (Seton) and Clorhexitulle (Hoechst) all contain chlorhexidine acetate 0.5%. Inadine (Johnson and Johnson Medical Ltd), which is similar in appearance to the other tulle products contains povidone iodine in a polyethylene glycol base on a knitted viscose fabric. It has been known for many years that the topical use of antibiotics may cause problems of skin sensitivity and the emergence of bacterial resistance. The use of medicated dressings should be reserved for the treatment of infected wounds and limited to those materials which contain povidone iodine or other suitable antimicrobial agents. The location and size of the wound are also important factors. A large, heavily exuding cavity may require the use of a relatively bulky dressing and thus preclude the use of other materials which are only available in small pack sizes. Similarly, the location of the lesion may make application of a particular product almost impossible. For example, the practical problems associated with the use of polysaccharide beads would probably preclude their use in a cavity on the buttocks or sacral region of a patient in traction. Wound related factors which have an influence upon dressing selection may therefore be summarised as shown below. Any or all of these factors may determine the performance requirements of a dressing and thus have a marked influence on the selection process. Table 1: Factors influencing dressing selection. The major characteristics of a dressing that determine its suitability for application to a particular type of wound include its conformability, fluid and odour absorbing characteristics, handling and adhesive properties and the presence of antibacterial and haemostatic activity where appropriate. Other more general factors which may also influence product selection include the potential for the dressing to cause sensitivity reactions, the ease of application and removal (including the production of pain and trauma to wound surface) and the interval between dressing changes. Dressings should also not shed particles or fibres that may delay healing or predispose the wound to infection. They should also not contain extractables that may have an adverse effect of cell growth. Although the health and nutritional status of an individual may have a profound effect upon the rate at which their wounds heal, these factors generally do not have such a marked influence on dressing selection. Patient related factors which are most likely to influence the choice of dressing include mobility and dexterity of the individual concerned (if they are required to change their own dressings), continence, and the need or desire to bathe or shower frequently. Patients with wounds related to some biochemical or physiological disorder such as leg ulcers will require the appropriate treatment to correct this condition which may involve surgery or the application of sustained graduated compression. The administration of medication such as corticosteroids may bring about changes to the structure of the skin and preclude the use of adhesive dressings or tapes. Some patients will exhibit sensitivity reactions to certain types of dressings, particularly those which contain iodine or antibiotics such as neomycin, and soframycin, others react badly to products bearing rubber and zinc oxide adhesives although the so called `hypoallergenic' adhesives can occasionally cause problems. Paste bandages containing preservatives similarly induce sensitivity reactions in certain individuals. All of these factors can have a major influence on the dressing which is finally selected. It is also not unusual for patients with chronic wounds - such as leg ulcers, to have very firm views on the dressings that they will accept, based upon prior experience with these or similar materials. The principal economic considerations relate to cost and availability. In the United Kindom, most problems of non-availability of dressings occur in the community, as products which are not included in the Drug Tariff cannot be obtained on NHS prescription. The most noticeable deficiencies in this area currently include the activated charcoal dressings (used for odour control) and cavity wound dressings. As many of the modern dressings are substantially more expensive than traditional cellulose-based products there is often resistance on the part of clinicians to order these new materials. It is often the case, however, that wounds dressed with the newer products respond to treatment more rapidly than those dressed with conventional materials. It is therefore important that any comparisons are made upon the basis of treatment costs not unit or pack costs of the dressings concerned. As no one dressing is suitable for the management of all types of wounds, and few are ideally suited for the treatment of a single wound during all stages of the healing cycle, successful wound management depends upon a flexible approach to the selection and use of products based upon an understanding of the healing process combined with a knowledge of the properties of the various dressings available. Without such knowledge and careful consideration of all the factors described above, dressing selection is likely to be arbitrary and potentially ineffective, wasteful both in terms of time and physical resources. Evans H., A treatment of last resort, Nursing Times, 1997, 93(23), 62-65 . Thomas S., Treating malodorous wounds, Community Outlook,, 1989, Oct, 27-29 . Thomas S., Pain and wound management, Community Outlook, 1989, July, 11-15 . Thomas S., Hay NP., In vitro investigations of a new hydrogel dressing, Journal of Wound Care, 1996, 5(3), 130-131 . Thomas S., Loveless P., An examination of the properties of 12 hydrocolloid dressings, World Wide Wounds, http://www.worldwidewounds.com/1997/july/Thomas-Hydronet/hydronet.html . Haury B., et al., Ed., Debridement: An essential component of traumatic wound care, Wound Healing and Infection, Appleton-Century-Crofts New York 1980. Hohn DC., Host resistance to infection: established and emerging concepts, ibid. Moore D., Hypochlorites: A review of the evidence, Journal of Wound Care, 1992, 1(4), 44-53 . Jacobsson S. et al., A new principle for the cleansing of infected wounds, Scand J plast reconstr Surg , 1976, 10, 65-72 . Bale S., A guide to wound debridement techniques, Journal of Wound Care , 1997, 6(4), 179-182 . Sugar sweetens the lot of patients with bedsores, JAMA, 1973, 223, 122 . Knutson R A. et al., Use of sugar and povidone iodine to enhance wound healing: five years experience, Sth med J, 1981, 74, 1329-1335 . Gordon H., et al., Sugar and wound healing, Lancet, 1985, 2, 663-664 . Middleton KR., Seal D., Sugar as an aid to wound healing, Pharm J , 1985, 235, 757-758 . Archer HG. et al., A controlled model of moist wound healing: comparison between semipermeable film antiseptics and sugar paste, J exp Path, 1990, 75, 155-170 . Thomas S., Jones M., Shutler S., Jones S., Using larvae in modern wound management, Journal of Wound Care, 1996, 5(1), 60-69 . Edwards J., Larval therapy in burns, 1997, Paper presented to 2nd World Conference on Biosurgery, Porthcawl (Proceedings in print). Graham K., The role of maggots in plastic surgery, 1997, Paper presented to 2nd World Conference on Biosurgery, Porthcawl (Proceedings in print). Wood RAB., Hughes LE., Silicone foam sponge for pilonidal sinus: a new technique for dressing open granulating wounds, Br med J, 1975, 3, 131-133 . Gupta R ., Foster ME., Miller E., Calcium alginate in the management of acute surgical wounds and abscesses, Journal of Tissue Viability, 1991, 1(4), 115-116 . Groves AR., Lawrence JC., Alginate dressings as a donor site haemostat, Ann R Coll Surg , 1986, 68, 27-28 . Attwood AI., Calcium alginate dressing accelerates graft donor site healing, December 1986, Paper presented to the Winter meeting of the British Association of Plastic Surgeons, England. .
Doherty C. et al., Granuflex hydrocolloid as a donor site dressing, Care of the critically ill, 1986, 2, 193-194 . Lawrence JC., Ed., The effect of bacteria and their products on the healing of skin wounds, Proceedings of a Symposium, Royal College of Physicians , Andover Medifax, London, 1987 . Wilson P. et al., Methicillin resistant Staphylococcus aureus and hydrocolloid dressings, Pharm J, 1988, 241, 787-788 . D'Arcy PF., Drugs on the skin: a clinical and pharmaceutical problem, Pharm J, 1972, 209, 491-492 .